As the badminton court is going to be your sporting domain, it is only sensible that you become familiar with its dimensions and the traps within it that await the careless or loose shot. Let's start by getting out the tape measure and providing the dimensions of the rectangular playing surface. The total length is 13.4 metres (44 feet in imperial measurement) with a total width of 5.18m for singles, 6.1m for doubles, the additional court space providing doubles players with more ground to cover and thereby making the game more challenging. The area within the singles and doubles sidelines is referred to as the tramlines. Each half of the court is divided by a centre line, bisected at a 90-degree angle by a short service and long service line. At each end, the court area is delineated by the back boundary line, which also doubles as the long service line in singles play. Within these lines is the area in which the shuttlecock is allowed to land in order to be deemed "good" on service, after which the entire court comes into play. It should also be noted that should the shuttle clip all or any part of a line during service or open play, it is also ruled "good". Perhaps a stranger aspect of the game than the court is the shuttle itself. Made traditionally from goose or duck feathers that give it the distinctive conical profile, they are also available in nylon, the latter offering more durability than the natural product. The feathers are bound into a cork base, which is covered in leather or rubber. Shuttles range in weight between 4.8 grams and 5.2 grams: the greater the weight, the faster the shuttle. The nylon variety retails in three colour codes that denote speed and the temperature they should be used in: green is the slowest with a recommended temperature range of 19-29 deg C; next comes blue/11-21 deg C; and finally red/below 14deg C. Temperature is important because the hotter the hall in which you are playing and the higher the altitude, the faster the shuttle will fly through the air. As a guide, it is recommended by Badminton England, the national governing body, that blue (medium speed) shuttles are used by newcomers to the game. Goose or duck feather shuttles are also available in a range of speed grades. Feather shuttles retail for around £12 to £16 with the nylon variety costing about half as much. On average, each tube will contain between six and a dozen shuttles. Heat and humidity can damage goose and duck feathers, so it is advisable to store them in their tube, in a cool place. Similarly for the nylon variety, returning them to their tube at the end of the game will prevent damage in transit. There are a number of high-profile manufacturers, each of whom claims specific trajectory and speed performance characteristics for their shuttles, but subtle differences in brands is not going to be an issue for rookies. 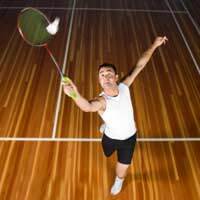 Becoming accustomed to the flight characteristics of the shuttle, along with the dynamics of the badminton court itself are the first steps towards building skill levels within the sport.